By far, the most common question asked of two sets of genomic features is whether or not any of the features in the two sets “overlap” with one another. This is known as feature intersection. 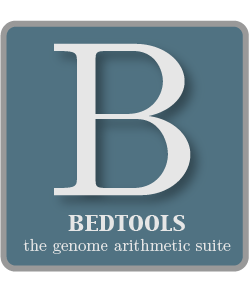 bedtools intersect allows one to screen for overlaps between two sets of genomic features. Moreover, it allows one to have fine control as to how the intersections are reported. bedtools intersect works with both BED/GFF/VCF and BAM files as input. -a BED/GFF/VCF file A. Each feature in A is compared to B in search of overlaps. Use “stdin” if passing A with a UNIX pipe. -b BED/GFF/VCF file B. Use “stdin” if passing B with a UNIX pipe. -wa Write the original entry in A for each overlap. -wb Write the original entry in B for each overlap. Useful for knowing what A overlaps. Restricted by -f and -r.
-wo Write the original A and B entries plus the number of base pairs of overlap between the two features. Only A features with overlap are reported. Restricted by -f and -r.
-wao Write the original A and B entries plus the number of base pairs of overlap between the two features. However, A features w/o overlap are also reported with a NULL B feature and overlap = 0. Restricted by -f and -r.
-u Write original A entry once if any overlaps found in B. In other words, just report the fact at least one overlap was found in B. Restricted by -f and -r.
-c For each entry in A, report the number of hits in B while restricting to -f. Reports 0 for A entries that have no overlap with B. Restricted by -f and -r.
-v Only report those entries in A that have no overlap in B. Restricted by -f and -r.
-r Require that the fraction of overlap be reciprocal for A and B. In other words, if -f is 0.90 and -r is used, this requires that B overlap at least 90% of A and that A also overlaps at least 90% of B. -split Treat “split” BAM (i.e., having an “N” CIGAR operation) or BED12 entries as distinct BED intervals. By default, if an overlap is found, bedtools intersect reports the shared interval between the two overlapping features. Instead, one can force bedtools intersect to report the original “A” feature when an overlap is found. As shown below, the entire “A” feature is reported, not just the portion that overlaps with the “B” feature. Similarly, one can force bedtools intersect to report the original “B” feature when an overlap is found. If just -wb is used, the overlapping portion of A will be reported followed by the original “B”. If both -wa and -wb are used, the originals of both “A” and “B” will be reported. Frequently a feature in “A” will overlap with multiple features in “B”. By default, bedtools intersect will report each overlap as a separate output line. However, one may want to simply know that there is at least one overlap (or none). When one uses the -u option, “A” features that overlap with one or more “B” features are reported once. Those that overlap with no “B” features are not reported at all. The -c option reports a column after each “A” feature indicating the number (0 or more) of overlapping features found in “B”. Therefore, each feature in A is reported once. There will likely be cases where you’d like to know which “A” features do not overlap with any of the “B” features. Perhaps you’d like to know which SNPs don’t overlap with any gene annotations. The -v (an homage to “grep -v”) option will only report those “A” features that have no overlaps in “B”. By default, bedtools intersect will report an overlap between A and B so long as there is at least one base pair is overlapping. Yet sometimes you may want to restrict reported overlaps between A and B to cases where the feature in B overlaps at least X% (e.g. 50%) of the A feature. The -f option does exactly this. Similarly, you may want to require that a minimal fraction of both the A and the B features is overlapped. For example, if feature A is 1kb and feature B is 1Mb, you might not want to report the overlap as feature A can overlap at most 1% of feature B. If one set -f to say, 0.02, and one also enable the -r (reciprocal overlap fraction required), this overlap would not be reported. By default, bedtools intersect will report overlaps between features even if the features are on opposite strands. However, if strand information is present in both BED files and the “-s” option is used, overlaps will only be reported when features are on the same strand. When comparing alignments in BAM format (-abam) to features in BED format (-b), bedtools intersect will, by default, write the output in BAM format. That is, each alignment in the BAM file that meets the user’s criteria will be written (to standard output) in BAM format. This serves as a mechanism to create subsets of BAM alignments are of biological interest, etc. Note that only the mate in the BAM alignment is compared to the BED file. Thus, if only one end of a paired-end sequence overlaps with a feature in B, then that end will be written to the BAM output. By contrast, the other mate for the pair will not be written. One should use pairToBed(Section 5.2) if one wants each BAM alignment for a pair to be written to BAM output. When comparing alignments in BAM format (-abam) to features in BED format (-b), bedtools intersect will optionally write the output in BED format. That is, each alignment in the BAM file is converted to a 6 column BED feature and if overlaps are found (or not) based on the user’s criteria, the BAM alignment will be reported in BED format. The BED “name” field is comprised of the RNAME field in the BAM alignment. If mate information is available, the mate (e.g., “/1” or “/2”) field will be appended to the name. The “score” field is the mapping quality score from the BAM alignment. As described in section 1.3.19, bedtools intersect will, by default, screen for overlaps against the entire span of a spliced/split BAM alignment or blocked BED12 feature. When dealing with RNA-seq reads, for example, one typically wants to only screen for overlaps for the portions of the reads that come from exons (and ignore the interstitial intron sequence). The -split command allows for such overlaps to be performed. For example, the diagram below illustrates the default behavior. The blue dots represent the “split/ spliced” portion of the alignment (i.e., CIGAR “N” operation). In this case, the two exon annotations are reported as overlapping with the “split” BAM alignment, but in addition, a third feature that overlaps the “split” portion of the alignment is also reported. In contrast, when using the -split option, only the exon overlaps are reported.